Revenue growth in the USA’s recorded music market accelerated last year, with overall industry sales increasing by $1.2bn. In 2016, the market increased by close to half that amount – $787m. 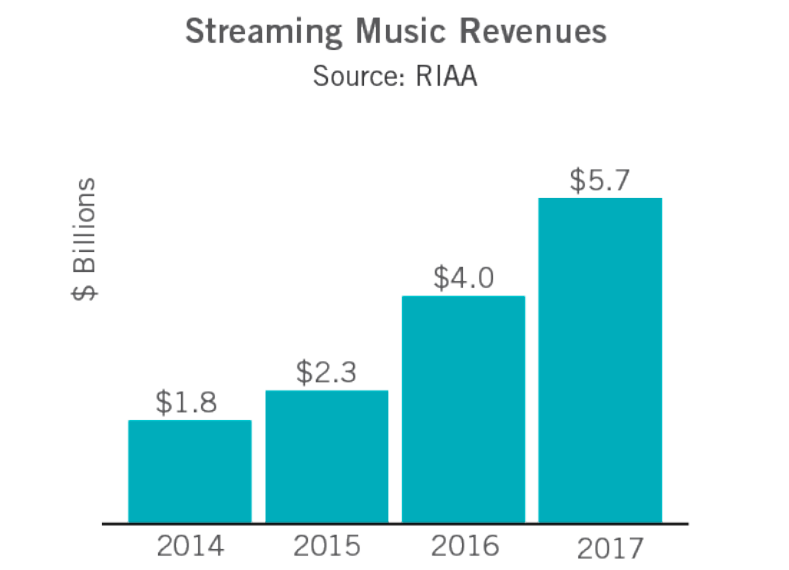 The US market brought in $8.72bn in total in 2017 across all formats, according to new RIAA stats, up 16.5% (or $1.23bn) year-on-year on a retail basis. And on a wholesale basis – ie. the money flowing through to labels and artists – revenues increased 12.6% (or $700m) to $5.9bn. The driving force behind this growth was – of course – streaming services, which saw their US retail revenues grow by 43% to $5.7bn last year. That was enough to claim 65% of the overall US recorded music market. The number of paying streaming subscribers to ‘full’ premium on-demand services hit 35.3m in the year on average – up by 56%, or 12.6m people, on the 22.7m monitored in 2016. This was a bigger jump in subscribers than that seen in 2017, when paid subscriptions moved up by 11.9m. 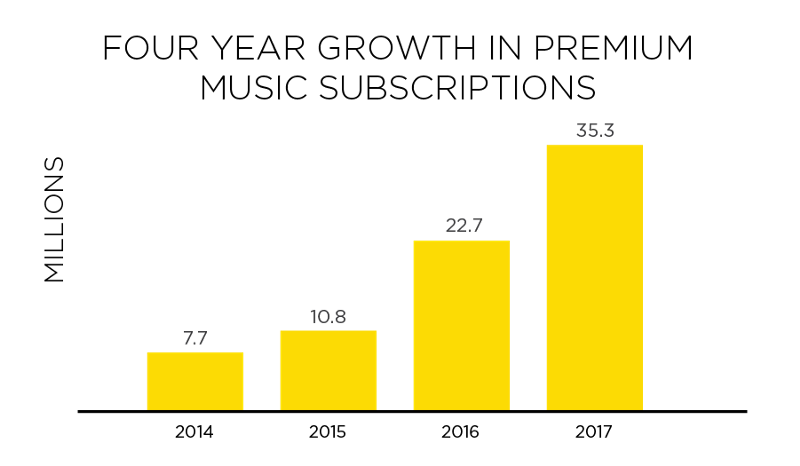 Because of this growth, paid streaming subscriptions to ‘full’ premium services like Apple Music and Spotify Premium generated $3.5bn in 2017, up 56% year-on-year. In addition, “limited tier” subscription services – like Amazon Prime and Pandora Plus – generated $591.6m last year, up 124.6% YoY. Combined, these streaming subscription categories generated more than $4bn in the 12 months. 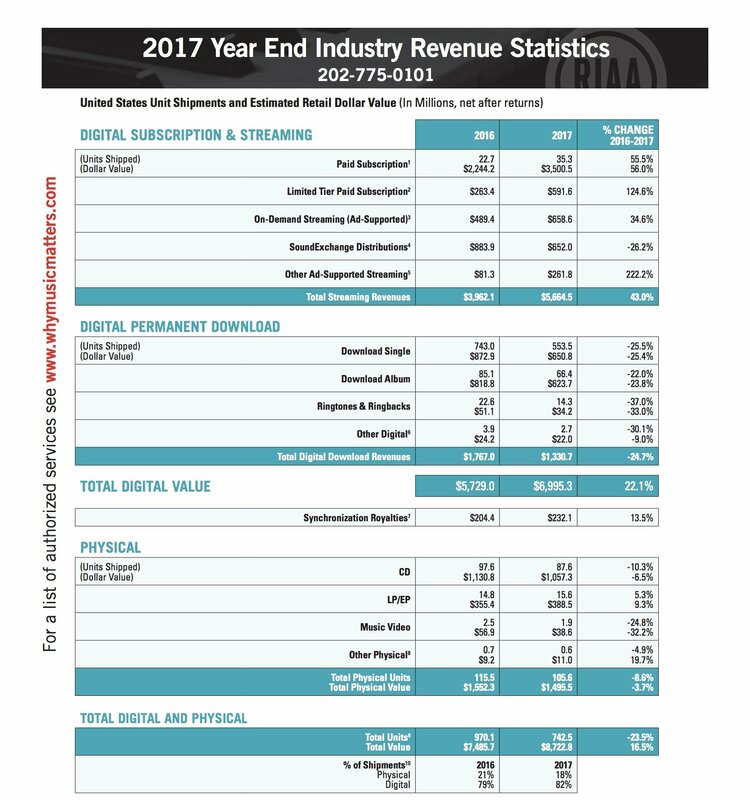 Ad-supported interactive streaming services like YouTube and Spotify’s free tier saw revenues grow 34.6% to $658.6m, while digital radio services – whose royalties are collected by SoundExchange – generated $652m, down 26% year-on-year. RIAA chief Cary Sherman was upbeat about the results today – but offered a note of circumspection over the future prospects of the industry, pointing out his concern regarding a “distorted market”. He said: “We‘re delighted by the progress so far, but to put the numbers in context, these two years of growth only return the business to 60% of its peak size — about where it stood ten years ago — and that’s ignoring inflation. And make no mistake, there’s still much work to be done in order to make this growth sustainable for the long term. “Growth is of course welcome, for many reasons, but especially because it will result in more investment in artists and music. You can see the full set of RIAA results below.